We sell a very wide range of fresh fruit, vegetables, salad and fresh herbs. Year-round staples are collected twice per week from New Smithfield Market in Manchester. 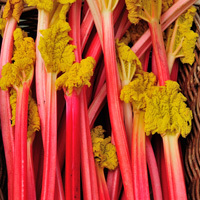 Seasonal produce is sourced from farms in Yorkshire and local gardeners who have surplus. We sell our produce loose, not pre-packed, so that you can purchase exactly the amount you require with no wastage. 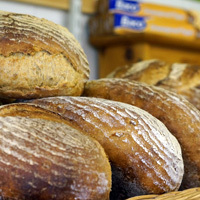 From Tuesdays to Saturdays, we sell fresh loaves from the Hand Made Bakery, just a few minutes away. Our regular favourites are Sleepless White, Malted and Seeded Granary, Wild White Sourdough and Yorkshire Leaven Sourdough. We also often have Sisu Rye, Hearth loaves and Wholemeal Cobs alongside a rotating ‘Special’ each week. On Mondays, we sell fresh, artisan bread from Roger's Bakery in Marsden. Roger bakes white, granary, wholemeal and a range of specials. Fortnightly on Fridays, we sell Gluten-free bread from the Wheat-free Bakery in Scotland. Please contact us to place an order in advance for this. 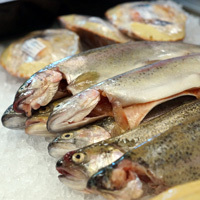 We have a delivery of fresh fish and seafood every day. Cooked sandwich prawns and raw Tiger prawns in the freezer. A favourite lunch item is our smoked mackerel, with or without peppercorns. We can order from our supplier from their huge range of wet fish, cooked fish and seafood for customer requests, please give us two days notice for this. We stock over 30 cheeses from the UK and Europe. 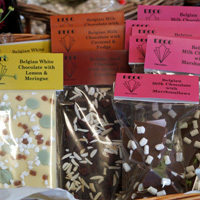 Including cheddars, Lancashires, blues, brie, soft cheeses, as well as goat's and ewe’s milk cheeses. 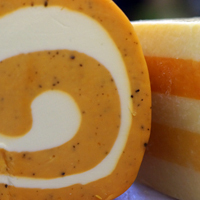 Local cheeses such as Pexommier from Todmorden and Yorkshire Dama halloumi are very popular. We sell a select range of cooked and cured pre-packed meats, as well as olives, artichoke hearts, semi-dried tomatoes and pates. 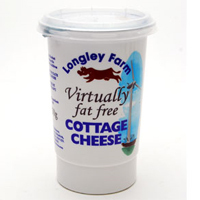 Our main supplier of Dairy produce is Longley Farm near Holmfirth. We carry almost their full range of yoghurts, creams, cottage cheeses, fromage frais and crème fraiche. We sell fresh, free-range eggs from near Holmfirth. Milk from Briggs dairy farm, here in Slaithwaite. Our selection of jams and marmalades is vast and ever-expanding as our producers invent different fruit combinations. Much is sourced from Pennine Country Markets producers. Also local home-producers who use their own home-grown fruit. 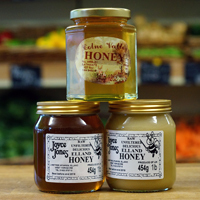 We sell local honey produced in and around the Colne Valley from four different bee-keepers. We keep a wide range of hot drinks, including loose-leaf and bags of Yorkshire tea, Clipper organic tea and Clipper infusions, a selection of ground coffee and coffee beans, including organic and Fair Trade options, hot chocolate, cocoa and Barley Cup. 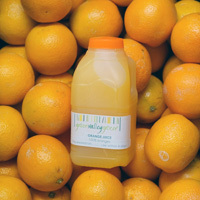 The ‘star’ of our cold drinks range is our Green Valley Grocer fresh orange juice, squeezed whilst you wait, in our Zumex machine. To fill a 500ml carton takes 7 to 10 oranges and is chock-full of vitamin C.
We also sell the Cawston Vale pressed apple juice range. Dairy-free and soya milk-alternative drinks. Our welsh dresser in the shop showcases Jane’s cakes and buns from ‘Homemade in Slaithwaite’ produced within metres of the shop and delivered daily on foot. 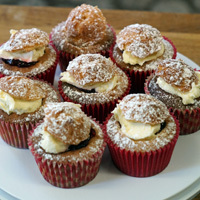 Her range includes Victoria sponges, coffee and walnut cakes, lemon drizzle cakes, bakewell tart, scones and flapjacks. Jane will make gluten-free versions of her cakes to order. For home-bakers, we have almost the full range of Doves Farm organic flours, alongside Shipton Mill, specialist Italian and gluten-free flours. We sell sugars and sweeteners, baking powder, mixed peel, cornflour, and greaseproof paper. 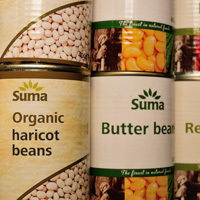 Most of our Wholefoods range is supplied by Suma in Elland. We sell a wide range of Suma-label dried fruit, rices, pulses, grains, pastas, as well as tinned soups and sauces, cooking oils and condiments. We offer organic options on some of this range. We stock over 100 dried herbs and spices, including specialist paprika from Spain and locally-produced curry mixes from Spice is Right at Linthwaite. Our wide range of breakfast cereals includes gluten-free options. We stock an impressive range of flavours of Green and Blacks and Divine chocolate in 100g bars. At certain times of the year we have handmade, artisan chocolate products from Deco Chocolates just a few miles away from the shop. For a healthy snack we have a selection of 9bars, sesame snaps and natural liquorice. We are not a florist and do not make specialist flower arrangements, however, we do support local producers. 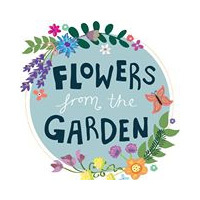 In season, we sell beautiful posies of cottage garden flowers, grown just a couple of miles away by Alison at “Flowers from the Garden”. She also makes table decorations and wreaths at Christmas. You can contact Alison direct for special commissions or orders. Some of our local suppliers and gardeners have surplus seeds, seedlings and plants which we sell at certain times of the year. 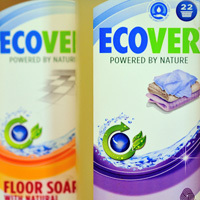 Ecover is our chosen brand for household and cleaning products and we are the only shop in Slaithwaite where you can bring your empty bottles to re-fill with Washing Up Liquid, Laundry Liquid and Fabric Conditioner. We also stock Ecover floor soap, bleach, stain remover, cream cleaner and dishwasher tablets. We sell a small range of Faith In Nature natural shampoos, conditioners, handwashes, shower gels and soaps, Kingfisher and Saracan toothpastes and Suma soap bars.